Preheat oven at 180° degrees (or 160° for fan forced oven). Place pork on to baking tray and cook for 25 mins, per 500 grams. Allow to stand for 10-15 mins once cooked. Pick the leaves from parsley and set aside. Add frozen chips to an oven tray and cook as per cooking instructions. To make the yoghurt sauce: add 1tsp minced garlic to 250ml of yoghurt and mix well and set aside. Once the pork has rested, pull apart in to bite size pieces drizzle with olive oil, salt and pepper. 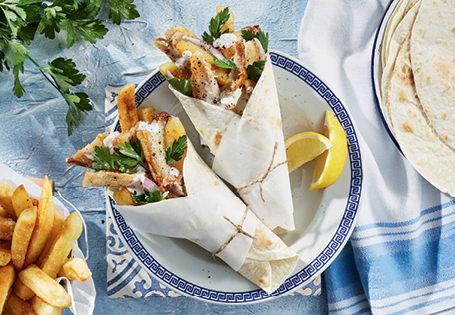 To assemble the Yeros - place wrap onto bench, layer roast pork, onions, parsley, yoghurt dressing and cooked chips. Fold the wrap as per instructions on the packaging and continue for the rest of the wraps. TIP: You can use grease proof paper strips and twine to wrap your yeros for decoration before serving.